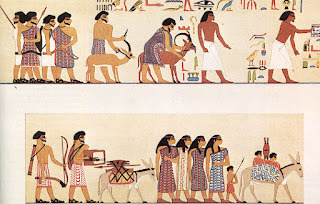 The Nubian army list covers the period of 3000 BC to 1480 BC which corresponds with the Old Kingdom Egyptian. From my scant research, the lands to the south known as Nubia are actually divided like Egypt in a lower and upper region. This is significant as it will influence my choice of painting schemes. Source: Ancient Sudan - Kush website. Bordering Egypt we find the nomadic tribes of Wawat, Irtjet and Setju inhabiting the scrub land to the west and east of the Nile. These people are akin to the Egyptians but having slightly darker skin. Travelling further south to the Dongola reach one encounters the darker skinned inhabitants normally associated with modern day Sudan. These are Black Hat Miniatures and the five packs ordered were enough to build a Nubian collection. This comprises of 1 x general (3Bw), 2 x clubmen (3Wb), 6 x archers (3Bw) and 3 x skirmishers (Ps) plus a camp guard. The extra archers will join the Old Kingdom Egyptians as Medjay mercenaries. Opting for the tribes of lower Nubia, I by painting their kilts first followed with their skin colour. The skin colour is a mix of flesh, mid-brown and a hint of red. This is later highlighted with a lighter shade to detail the muscle, hands and face. A wash, a mix of Ogryn Flesh (washes) and Rhinox Hide (base) was applied over the figure. This step was a departure from my standard ‘out of the bottle’ technique, but the result turned out well. The Hyksos army have two sub-lists dating 1645 BC – 1591 BC and 1590 BC – 1337 BC. 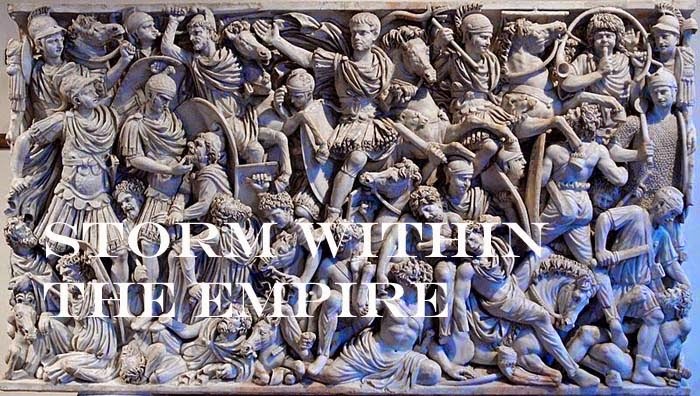 The difference between the two is the increase number of chariots replacing units of retainers and Bedouin auxiliaries. Where the Hyksos came from is still a matter of debate as some modern authors regard the ‘rulers from foreign lands’ as coming from fertile crescent while others view them as migratory Amorite. Most authors will agree that their presence was a steady successive wave of migration to the eastern delta and not an invasion. 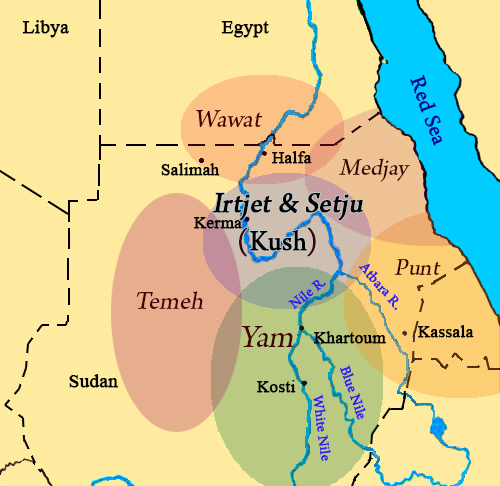 Their governance of the Nile region is marked as the Fifteenth Dynasty and during this time, Upper Egypt remained an independent kingdom establishing the Abydos Dynasty. These are Black Hat Miniatures from their Biblical range and like the Old Kingdom Egyptians are very well detailed. I have seen depictions of Hyksos in multicoloured kilts and tunics presenting tribute to a pharaoh/king, I view this as an activity done by administrative functionaries and not military types. Since the armouries and factories of the eastern nomes were taken over, I decided to paint the majority of infantry in standard white kilts with the exception of the Bedouin auxiliaries, preferring their homespun cloth. The horses and chariot of general’s element are somewhat restrained, that is no plumage or decorations signifying a leader’s equipment. The archer figure (general) is modestly dressed with a cloak and this I embellished a bit. This is a second command of Old Kingdom Egyptian and was built so the internal conflicts between Upper and Lower Egypt could be fought. Also, pairing the two would permit larger battles against the Later Amorite and their Bedouin allies. The miniatures are Black Hat figures with extra figures filling out the options listed for other armies. The Hyksos for example may have an Egyptian levy (7Hd) and skirmishers (Ps) and extra Nubian will supply the Medjay (3Bw) as an option for the Egyptian force. This completes the project for the moment as the Sumerians to be produced by Eureka may become available in May or early June. In the meantime, there are plenty of armies to use for a few campaigns. Of the original figures that needed refurbishment only three chariot and some Libyan bowmen remain over. Two chariots are earmarked for the Libyan ‘b’ sub-list for which the bowmen will become crew and the third chariot will become the transport for Ahmose of the Old Kingdom ‘b’ sub-list, the charioteer and Pharaoh are extra figures from the last Black Hat purchase. Interesting and great post...and beautiful army! “An army a week” is a terrific achievement. Congrats! Actually, I brought the tempo down some since the start of the project nine weeks ago (19 Dec.). In that time, I have completed the refurbishment and added more armies to the collection which are all 3.0 compliant.